The Narbon vetch (Vicia narbonensis L.) is an annual legume with thick, angular and erect pubescent stems that can grow without support up to 30-60 cm high (Ecocrop, 2013; Bryant et al., 2011). The root system is well developed. The leaves are bi-foliolate, born in pairs, with elliptic to ovate leaflets, 20-50 mm long x 20-30 mm broad. The flowers are papillonaceous, purple or white in colour, and borne in axillary racemes of up to 40 flowers. The fruit is a dehiscent pod containing several smooth seeds, often called Narbon beans, which are 5.5-6 mm wide and brown in colour (Ecocrop, 2013; Bryant et al., 2011; HYPPA, 2000). Like many other Vicia species, the culture of Vicia narbonensis has long been neglected due to the presence of antinutritional factors that also cause an undesirable odour and taste in grain and foliage (see Potential constraints on the "Nutritional aspects" tab). Since the 1990s, it has become more popular, for instance in Australia, and it is now used as a multi-purpose legume for grain, fodder and green manure in areas of low to medium rainfall (DAFWA, 2005). Once cooked to remove antinutritional factors, Narbon beans can be eaten and are described as being of high quality (Bryant et al., 2011). The Narbon vetch is a promising forage, with a good resistance to drought, cold, and aphids. The green parts are used as fodder, grazed or cut for hay. An N-fixing legume, the Narbon vetch is increasingly used as green manure and is also a valuable trap crop for the parasitic weed Orobanche crenata (Kroschel, 2001). The Narbon vetch (Vicia narbonensis L.) is, with the faba bean Vicia faba, the common vetch Vicia sativa, the bitter vetch Vicia ervilia, and the broad pod vetch Vicia peregrina, one of the species that have been domesticated since the early centuries of agriculture (Bryant et al., 2011). It is thought to have originated in North-West Asia and then to have spread to the Mediterranean Basin. Because of its high content in antinutritional factors, the Narbon vetch was not widely grown before the 16th century, when the Reform movement promoted legume grains as a soil improver (Enneking et al., 1995). Further development occurred at the end of the 18th century in Germany, Scotland, and Australia. In the 1960s, 7000 ha were cultivated in Spain and seed production was 4600 t/year. The Narbon vetch is grown as a dual purpose crop for animal feed and human nutrition in Syria, Northern Iraq and parts of Turkey (Bennett et al., 1997). In the 2000s, several breeding and agronomic programs have introduced Narbon vetch into Turkish farming systems (Uzunmehmetoglu et al., 2006), but the plant has not been exploited extensively (Kendir et al., 2008). In Australia, the Narbon vetch is used on site as fodder, green manure and grain for cattle (DAFWA, 2005). Vicia narbonensis naturally occurs in grasslands or as a weed in cultivated land in Central Europe, the Mediterranean region, the Middle East, Ethiopia, Central Asia and India (Ecocrop, 2013; Kendir et al., 2009; Bennett et al., 1997). It is a fast growing crop, with vigorous regrowth. It does better under warm temperatures and drier conditions (annual rainfall below 350 mm) than faba bean. It is tolerant to cold. Aerial parts that may be damaged by frost die, but new shoots regrow when conditions become better in the spring. It can grow in many soils from sandy soils to loams provided they are well-drained. The Narbon vetch has low input requirements (fertilizer, pesticides) but does particularly well on alkaline soils and responds positively to P fertilizer (Mebarkia et al., 2013; Sanchez-Vioque et al., 2011; Velthuis, 1985). Narbon vetch seeds can be sown on soils from which sticks and stones have been removed. Seeds should be sown at 4-6 cm depth to protect the rhizobial inoculum from heating or drying and to promote root development, which will result in better plant anchorage and a lower risk of lodging (DAFWA, 2005). Seed yield was about 4.5 ton/ha DM. In Algeria, seed yield was 1.56 ton/ha in semi-arid conditions with 120 kg P fertilizer (Mebarkia et al., 2013). In Iran, Narbon beans harvested at full-bloom outyielded other vetches at 7 t DM/ha (Rahmati et al., 2012). In Western Australia, under low rainfall conditions, Vicia narbonensis produces about 70% of the yield of field peas. This is comparable to faba bean in medium rainfall areas and even higher (+121%) than faba bean in low rainfall areas (DAFWA, 2005; Siddique et al., 1999). The Narbon vetch can be sown in a mixture with other vetches or with cereals (oats or barley). These mixtures can be directly grazed or cut for hay or silage. It is recommended to cut the sward when the plant is at the flowering stage and to chop the material extensively to make good quality silage (DAFWA, 2005; Mateo-Box, 1961). In Turkey, silage made with mixtures of barley and Narbon vetch gave a higher protein yield than hay made from the same mixture (Altinok et al., 2002). Narbon vetch forage compared favourably to common vetch and woolly pod vetch (Vicia villosa), as it yielded more DM and protein (1.4 t/ha) (Rahmati et al., 2012). The Narbon vetch can be used as a forage crop or for green manure, and has great importance in crop rotations (Altinok et al., 2002). It is a valuable trap crop for the parasitic weed Orobanche crenata (Kroschel, 2001). The Narbon vetch can replace fallow land of the traditional barley-fallow rotations in the Eastern Mediterranean region, and can reduce feed shortages in drier areas (Jones et al., 2000; Abd El Moneim, 1992). Narbon beans are rich in protein (24-30% DM) though slightly less than faba beans. Fibre content is moderate with ADF in the 10-18% DM range. Narbon beans also contain starch (24% DM). Like other Vicia species, the seed of the Narbon vetch contains several antinutritional factors. Levels of inhibitors of trypsin and chymotrypsin in Narbon beans are lower than those in peas, chick peas, vetches and lentils (Saini et al., 1988). However, they contain 10-30 g/kg of γ-glutamyl-S-ethenyl-cysteine (GEC), a toxic, sulphur-rich (11.6%) dipeptide not found in other vetch species (Francis et al., 1999). The GEC content is closely related to sulfur content in the seeds (Berger et al., 1999). GEC is an off-flavour precursor closely related to similar compounds in chives (Allium schoenoprasum) and onions (Allium cepa) (Enneking, 1995). The main consequence of GEC is that it makes raw Narbon beans unpalatable to animals and humans (Bryant et al., 2011; Sanchez-Vioque et al., 2011). Some cases of nephritis and damage to red blood cells in pigs and acute tubular nephrosis in broiler chickens might be due to GEC, but no toxicity has been shown in ruminants (Wali et al., 2005; Davies, 1987; Hadjipanayiotou, 2000; Jacques et al., 1994). GEC can be readily destroyed by acid hydrolysis (Enneking, 1995). It might be possible to control GEC content in Narbon beans through the selection of genotypes that do not accumulate sulphur in seeds (Berger et al., 1999). For example, some subspecies such as Vicia narbonensis var. japonica contain less GEC (Berger et al., 2003). GEC content was shown to be higher in seeds of plants grown on soils rich in sulphur or on alkaline, saline or clayey soils (Berger et al., 1999). Narbon beans (raw or processed) and forage can be fed to ruminants (Selmi et al., 2010; Chiofalo et al., 2007; Hadjipanayiotou, 2003; Yu et al., 2001; Jacques et al., 1994; Karabulut et al., 1989). 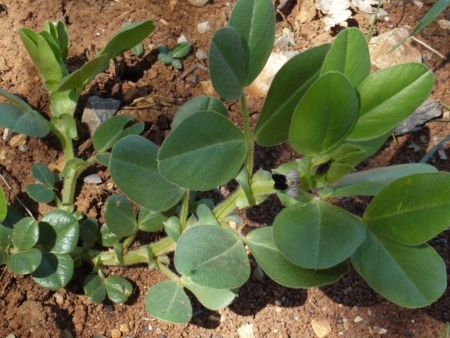 Narbon beans can be used in ruminant diets as a partial substitute for soybean meal or legume seeds such as pea, common vetch and lupin (Hadjipanayiotou, 2003). However, performance results are variable and deleterious effects have been noted in sheep and dairy cows (see below). Narbon beans are digestible: reported in vitro (OM digestibility 88%) and in vivo digestibilities (78% for DM, 80% for OM and 75% for protein) are high (Hadjipanayiotou, 2000). The protein is highly degradable in the rumen (70-80% effective degradability). GEC may be a source or sulphur-containing amino acids for ruminants (Enneking, 1995). Calves can be fed on crushed Narbon beans once they become acclimatized to the distinctive flavour. Narbon beans should not be fed to dairy cows as they produce an off-flavour in milk (Mateo-Box, 1961). Narbon beans are a valuable supplement for roughage-based diets or as a component of concentrates for sheep feeding (Yu et al., 2001; Jacques et al., 1994; Kansu, 1961). Mature Merino wethers fed on Narbon beans (1% or 2% BW/d) had higher growth rates (128 g/d vs. 58 g/d at 1% BW and 99 vs. 90 g/d at 2% BW) than unsupplemented wethers (Jacques et al., 1994). When Narbon beans were compared to peas as a supplement (1% or 2% BW/d) to pasture, intake was slower and the highest performance was obtained at the lower inclusion rate (Jacques, 1990 cited by Enneking, 1995). It was hypothesized that the slower intake resulted in more stable rumen conditions and subsequent greater growth rate (Jacques et al., 1994; Jacques, 1990 cited by Enneking, 1995). Lambs fed on a roughage-based diet and supplemented with raw or roasted Narbon beans (15% DM basis) had significantly higher DM and OM digestibilities and higher daily gain. Feed conversion ratio was lowered and meat quality was unaffected, though lambs fed on roasted Narbon beans had a slightly higher dressing percentage and enhanced flavour and aroma (Yu et al., 2001). Narbon beans offered to growing lambs as a soybean meal replacer grew at a similar rate as those receiving the soybean meal (Hadjipanayiotou, 2003). There have been contradictory results on the effect of Narbon beans on wool production (growth rate and quality). Six-month old Suffolk x Merino wethers fed on Narbon beans yielded less wool than control sheep. It was, therefore, recommended that Narbon beans were not fed to wool-producing sheep (Allden et al., 1980). However, a later experiment with Merino wethers showed that wool growth rate remained unaffected by Narbon beans (Jacques et al., 1994). The occasional deleterious effects of Narbon beans on sheep performance were not observed in goats (Hadjipanayiotou, 2003). Information on Narbon vetch forage is limited. It can be grazed or offered as hay or silage. 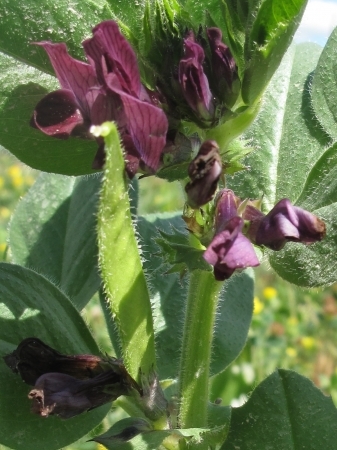 The plant contains less fibre and its dry matter is more degradable than that of common vetch and woolly pod vetch (Vicia villosa) (Rahmati et al., 2012). Reported values for in vivo OM digestibility are rather high (70-80%) (Alibes et al., 1990; Neumark, 1970), but an in vitro DM digestibility value was lower (55%). The digestibility of the forage declines rapidly as the plant matures and its fibre content and lignification increases (Rahmati et al., 2012). Narbon vetch straw had low in vitro and in vivo digestibility values (less than 50%) (Hadjipanayiotou, 2000). Finishing Charolais bulls, supplemented with 10% fresh Narbon vetch forage, as a partial substitution for soybean meal, had similar daily weight gains and feed conversion ratios as the controls (Chiofalo et al., 2007). Feeding Narbon beans to pigs is not recommended as these seeds are slightly toxic and unpalatable to pigs due to the presence of GEC. Pigs fed 35% (DM basis) Narbon beans had reduced feed intake, and developed mild interstitial nephritis and oxalate-type crystals in the kidneys (Davies, 1987). When used as a partial substitute for soybean meal, the diet was unpalatable and growing pigs fed 10% Narbon beans had lower feed intakes, daily weight gains, degraded feed conversion ratios, lower carcass yields and main lean cuts (Mercado et al., 2013; Gomez-Fernandez et al., 2013). Narbon beans have a low nutritional value for poultry and are unpalatable to them (Mateo-Box, 1961). Their potential as a soybean meal replacer has been regularly assessed in poultry, and experimental results have shown that it was possible to include 10% Narbon beans in poultry diets without impairing animal performance (Wali et al., 2005; Charalambous et al., 1999; Eason et al., 1990). In 1 day-old broilers, Narbon beans were included at up to 10% for 21 days without hampering animal performance (Eason et al., 1990). Narbon beans were also offered at 10% of DM for 8 weeks to broilers as a partial substitute for soybean meal without deleterious effects. Higher inclusion rates impaired animal performance and health (Wali et al., 2005). In a longer feeding trial, Narbon beans offered to broilers for 42 days at 8, 14 or 20% had negative effects on feed intake and weight gains, and mortality increased at the 20% inclusion rate (Johnson et al., 1990). Processing may improve the nutritional value of Narbon beans: autoclaving increased feed intake and growth performance of broilers at 10% inclusion in the diet, but there was no benefit from feeding raw beans (Charalambous et al., 1999). No publication on the utilisation of any part of Vicia narbonensis in domestic rabbit feeding seems available in the international literature (November 2013). 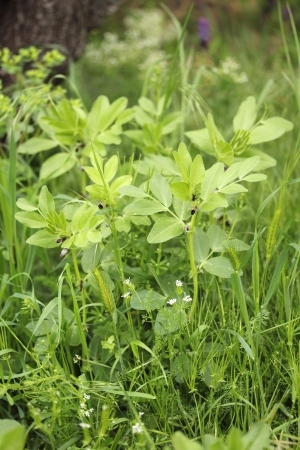 Nevertheless, because green forage or hay of narbon vetch could be used safely in all types of cattle feeding (Enneking et al., 1995), it could be assumed that this forages is also usable for rabbit feeding. 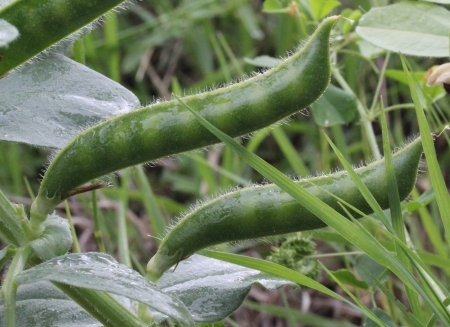 Even if some good results were obtained with narbon beans in sheep feeding (Jacques et al., 1994), some reductions of growth rate were also observed with Vicia narbonensis grain in lambs, when compared to soybean meal or common pea grain (Economides et al., 1999). Thus, the use of Narbon beans could not be yet recommended in rabbits feeding until further specific studies. Economides, S., Koumas, A., 1999. Replacement of soybean meal with pea meal, sunflower meal, narbon vetch meal or urea in concentrate diets of early-weaned lambs. Agric. Res. Inst. Cyprus, Technical Bulletin., 11 pp.